Sarah has just had confirmation from weather router Lee that Sunday 29th is still a viable option for leaving. 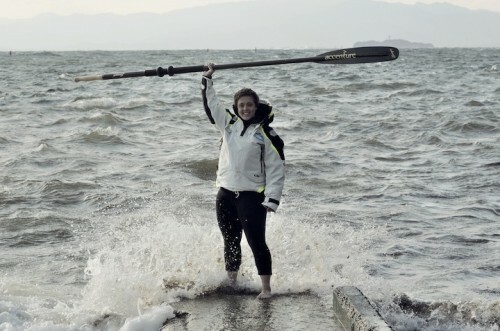 She aims to push off from Choshi Marina at around 0900 local time after a champagne toast and address. If you are in Japan and able, Sarah would love to have you there to wave her off on her voyage. For any press wishing to accompany her on the press boat please email press@sarahouten.com for all the details. 39 Responses to Launch day: Sunday 29th! Excellent choice of departure date too (fingers crossed for the weather) – i’m heading back out on my walk the same day too. Safe onwards tripping Raz – may the winds be at your back too! Woo Hoo, Go Sarah. Looking forward to your updates. And I’ll be praying for you too. Excellent news, and all good wishes. I still have my doubts as to whether what you’re planning is actually doable, but I have absolutely no doubts that if I’m wrong, you are the person to prove it. Supporting you all the way. I wish you a safe and fun trip! Looking forward to follow you through your website. Good luck! Great news Sarah! !, finally, I have been checking for your departure every day and now will follow on your trip every day. You are an inspiration. Best wishes. Uhnnnnnnnnnn, I’m not able to go Choshi…….that day…. Good luck, The wind pushes you and the stars leads you to Canada! Hope see you in London at the day you’re back!! Good Luck Sarah!! Be safe and stay healthy. Remember your ABC! We will track you on your website from our classroom in Tokyo. We are your number one fans. Hope to see you again. Maybe you could do the journey the other way round!! 🙂 Woohoo! Go Sarah!! Class 5A, how happy I am to hear from you! Do make sure you ask Ms Lee to book in a call via hello@sarahouten.com and Gulliver and I can update you on our progress and wildlife sightings. The girls were really excited when I told you we could do that! We’ll definitely keep track of where you are and try it out! You are a very brave Person! Can’t be there in Choshi,but hopefully Vancouver. Don’t get wet ! All the very very best to you and your efforts, Isle of Wight behind you. Lovely to talk to you this week. Hope you have enough chocolate! Saw you paddle off from London Bridge and have followed your amazing journey ever since. Will say a prayer for you and Gulliver as you set out from Choshi. Best wishes for the challenge ahead. hi sarah,all the best for the launch on sunday,good luck on your travels,i’m sure that you and gulliver will be a good team and look after one another on this epic venture,as always in awe of your energy vim and courage,will avidly follow progress. The Baldwin’s are excited for you Sarah! We will be praying for a safe passage and good landing in North America! Can’t wait to meet-up when you cycle to the East Coast! God Speed. Good luck Sarah. You’re such an inspiration! Safe journey Sarah! All warm wishes from Canada as you continue your epic journey. Big hugs!! Godspeed Sarah and I wish you all the best of luck in the world. My children and I will continue to follow your fabulous adventure!! Good luck from us all Sarah! Have a safe journey!! Great news Sarah, as before we shall be following you all the way. Hope the widns blow iyou inthe right direction you need. You really are an inspiration to us all. Much love for now, you have so many followers and will be having many more before you get back to London. Take great care and enjoy eating the chocolates, how many bars have you packed this time. I wish you a safe journey Sarah. I,ll be with you all the way.I hope all your equipment has been checked out thoroughly,especially the navigation equipment. I suppose you will be in contact with passing ships and get a blast from the horn. Keep the blogs going if you have time. God Bless Peter Nottingham. Of course I remember you Jill and stan! Either you or I were filling our water tanks that day under glorious sunshine. Here’s hoping for no warm up laps this time! Hoping all is very well out in Freo. Say hello to RPYC for me. Good luck for the 29th your strength and determination will do the rest and Gulliver ofcourse! I am Japanese my son lives in Victoria Canada. I Pray you will arrive at Canada.